Council housing blocks are not what you’d normally want to visit on any holiday sightseeing tours. However, in Vienna, the Hundertwasserhaus is something quite extraordinary. Hundertwasserhaus was originally a dour council housing block. Friedensreich Hundertwasser, an Austrian artist, wanted to prevent something ugly from going up in its place and so he designed Hundertwasserhaus. He took no payment for the design of the house, declaring that avoiding something ugly was worth it. The apartment block was built between 1983 and 1986 by architects Joseph Krawina and Peter Pelikan. Hundertwasser’s design transformed the block into higgledy-piggledy apartments as Hundertwasser was of the view that “the straight line is godless”. Hence you’ll see that nothing about these blocks are straight. Hundertwasserhaus features undulating floors, (“an uneven floor is a divine melody to the feet”), a roof covered with earth and grass and large trees growing from inside the rooms with branches extending from windows. 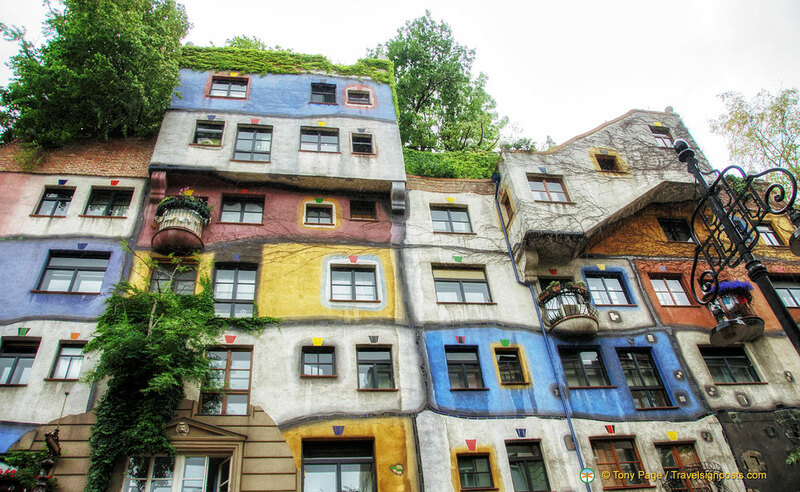 Within Hundertwasserhaus are 52 apartments, four offices, 16 private terraces and three communal terraces, and a total of 250 trees and bushes. Hundertwasserhaus has become one of Vienna’s most visited apartment blocks and it is now part of Austria’s cultural heritage. Hundertwasserhaus is a great example of how one artist’s brilliant idea can transform boring and ugly council housing blocks into magnificent architectural works of art. Hundertwasserhaus is located at Kegelgasse 34-38, 1030 Vienna. Nearby is the Kunst Haus Wien which houses the Museum Hundertwasser with the world’s only permanent collection of Hundertwasser’s work. We first discovered & visited Hundertwasserhaus about fifteen years ago. We were in Vienna in December to visit the fantastic Christmas markets and decided to swing by thinking we could get a few great photos to put on Instagram. We were rather disappointed to see that the building looks really dull and faded – it looks like it hasn’t been painted anytime since our last visit. When we first visited it was really colourful, bold & beautiful, so hope it gets a fresh coat of paint soon.